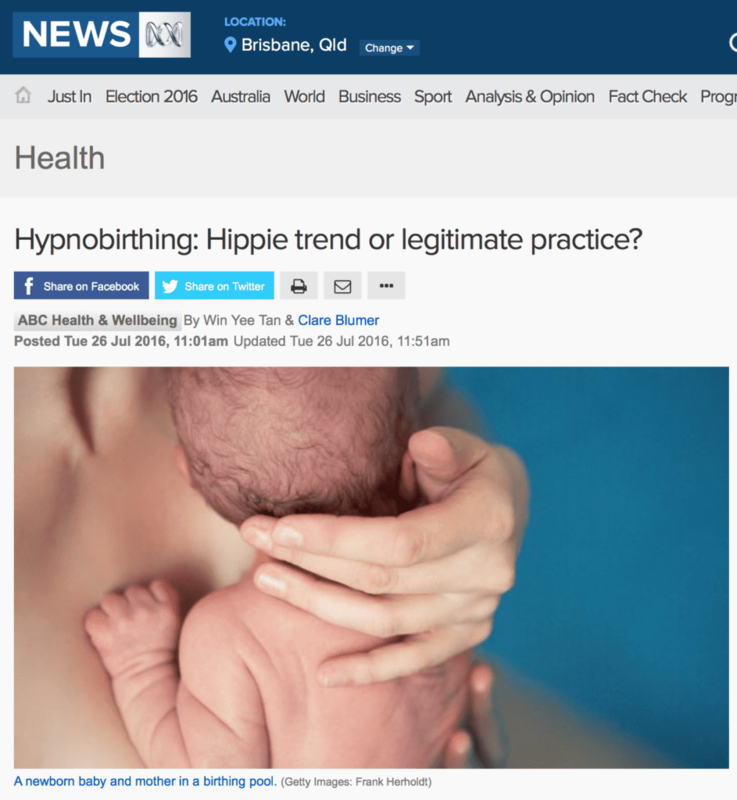 The ABC has featured the article Hypnobirthing: Hippie Trend or Legitimate Practice? which explores what hypnobirthing is all about and de-bunks many of the myths surrounding it. The article has been very popular and is also featured on the MamaMia website. Leading Australian childbirth experts Professor Hannah Dahlen, Dr Allan Cynan and Melissa Spilsted (Director of Hypnobirthing Australia) are all quoted in the article, as are Hypnobirthing Australia Practitioners and parents who have used these techniques for their own births. This article has generated hundreds of comments from the public and has been widely shared amongst parents throughout Australia! CLICK HERE to read this very well researched and informative article about hypnobirthing. Many mothers who have tried hypnobirthing swear by it as a powerful and transformative experience, but does it actually work? The idea that childbirth is an intensely painful, exhausting and nightmarish experience is a fairly commonly held view in our society. Pregnant women are often terrified in the lead-up to the birth. They shudder at the thought of hours of labour with painful contractions, pushing the baby and the possibility of body tissue tearing. It’s partly why many willingly choose pain relief at the onset of labour. However, for a growing number of women, hypnosis is transforming the birth experience. Women choosing to have a hypnobirth say their experience of childbirth is not only less painful, it’s also an empowering event that helps to set a positive mark to the start of motherhood. There are no pocket watches swinging from side to side during a hypnobirth. Nor is the birth mother hypnotised before birth, so that when she hears the word ‘push’ she becomes a pain-free island of calm. It’s more a form of deep meditation, which encourages women to use their minds to manage the pain and unpredictability of childbirth. Advocates say because of this altered state of consciousness, the pain experienced in labour can become a controlled sensation for the woman. There is not one definitive way to have a hypnotherapy-assisted birth, and in most cases the birth mother learns techniques to apply in the birthing room herself, without a therapist present. Melissa Spilsted, founder of Hypnobirthing Australia, says the three main methods used are breathing techniques, positive affirmations, and self-hypnosis. These are practised during pregnancy and also used for stress relief and focus in preparation for, during, and after birth. Every surge (contraction) of my body brings my baby closer to my arms. Ms Spilsted says self-hypnosis can be taught to mothers by creating “hypnotic triggers, anchors and deepeners, so that a deep state of relaxation can be more easily achieved during birthing”. Tasmanian mother Ange Vincent is a registered hypnobirthing practitioner who has given birth twice. During her first birth, Ms Vincent felt she could not cope with the pain she endured. Her labour slowed, and she ended up having a series of medical interventions, which included an epidural and a forceps delivery. Ms Vincent said she was traumatised from that birth. “I was needing a lot of support and I did take an [emotional] dip about nine months later. Mentally, it was a slow burn and it didn’t feel like I recovered as quickly,” she said. Having heard about hypnobirthing through her work as a nurse, she decided to enrol in a course to prepare for her second child. Using hypnobirthing techniques, Ms Vincent was able to greatly reduce her anxiety, which allowed her to give birth to her second child without any pain relief. Hannah Dahlen, the Professor of Midwifery at the University of Western Sydney, says hypnobirthing works because it helps to remove the fear many women feel about childbirth. Dr Dahlen says in our society, fear is often synonymous with childbirth. This is problematic, because fear causes muscle tension, which exacerbates the pain in labour. She says medical professionals can subtly instil fear in expectant mothers, sometimes by suggesting that the baby’s health may be negatively impacted if they choose not to accept medical interventions such as caesarean sections, episiotomies, and epidurals. According to Dr Dahlen, doctors often suggest caesarean sections to expectant mothers whose babies are “a bit on the big side”. Or women may be told they’re not capable of delivering a baby naturally. “Practitioners may say something like ‘your uterus isn’t really working’ or ‘your pelvis isn’t big enough’,” Dr Dahlen said. And she says the irony is that the more interventions occur, the more likely women are to feel fearful about birth. Dr Dahlen says in some cases medical intervention is absolutely necessary during childbirth, and without it some women and their babies would die. But she insists most women do not require such assistance, and it is often these women who suffer from the fear that surrounds labour. “We’ve created quite an atmosphere around fear in birth,” she said. “TV programs that we show unfortunately are not balanced. TV and media are often about entertainment and drama, and we tend to overemphasise things going wrong. Allan Cyna, a senior anaesthetist and hypnotherapist from Adelaide’s Women’s and Children’s Hospital, says hypnobirthing encourages women to focus on things other than the pain of birth. “Instead of viewing a contraction as painful, women can focus on the excitement they feel to meet their child,” Dr Cyna said. The effectiveness of hypnobirthing as a pain reduction technique in labour is still subject to debate. A recent Cochrane review found that while hypnobirthing did not appear to cause any harm and mothers took less pain medication, having a hypnobirth did not reduce the amount of epidurals (spinal taps for pain relief) requested by the birth mother. Both Dr Cyna and Dr Dahlen say that research may be flawed. The Cochrane review evaluated nine hypnobirth trials, but the doctors say there were considerable differences between these studies. For example, eight trials assessed antenatal hypnotherapy, while one looked at hypnotherapy during labour. Also, some of the hypnobirthing courses in the study lasted only 30 minutes — far too short to cause lasting effects on the women’s birth experience. Because of these issues, Dr Cyna says the value of hypnobirthing as an effective pain management technique is yet to be determined. So what can explain its increasing popularity? Ms Spilsted says pain relief isn’t the only reason for women to use hypnotherapy, and it can be about mothers taking back control of the birth experience. “We know that sometimes nature may need a helping hand, and we are able to cope with this better when we feel an element of control,” she said. For Ms Vincent, pain relief wasn’t the only motivation to try a different technique in the lead-up to her second baby. She has a history of anxiety, and she credits hypnobirthing for improving her anxiety levels as well as her ability to cope with the enormous changes that motherhood has brought. “I’ve got tools for how to manage anxiety in my life … [I found a] massive, massive change in my capacity to sit in the space of being a new parent and not be anxious about all of it,” she said. About a month ago, Kathryn Bell, a doula and hypnobirthing practitioner from Sydney’s Northern Beaches, was also preparing for the birth of her second child — and her first hypnotherapy-assisted birth. She shared her vision of her ideal home birth: quiet, in a birthing pool, with her six-year-old daughter announcing the gender, and her husband Greg playing a hands-on role in receiving the baby. Ms Bell also saw a doctor to make sure that home birthing remained a safe option for her and the baby, and she was seeing her midwives regularly for check-ups in the weeks before the due date. “I know that fear drives tension, drives pain. So I’m not fearful,” she said. The ABC caught up with Ms Bell 12 days after her hypnobirth experience. The baby was delivered safely — but with a much hastier arrival than expected. Ms Bell said she woke up having contractions about 11:00pm, after falling asleep beside her husband with a hypnobirth track playing. Her husband Greg was readying the birthing pool when she realised it was time for her to give birth. The pool didn’t get filled, nor had the midwives arrived by the time Ms Bell gave birth to her second daughter. “I’m feeling proud of myself. It’s a really empowering thing, giving birth,” Ms Bell said. And how about that childbirth pain? Ms Bell says she didn’t use any pain medication, and she now has a different way of viewing the pain of childbirth, learned from practising self-hypnosis. “You go with your body because [you don’t perceive] what’s going on as a threat,” she said.